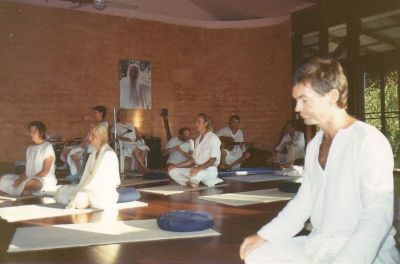 Although the Meditation Hall is reserved at the above times, meditations are not necessarily held each day, and there is no designated Gondwana resident responsible for the meditations. On an average day, several participants are likely to attend the Dynamic meditation session, but except as part of a larger event at the Meditation Hall, there is a good chance there may be no other meditators for the Vipassana and Kundalini meditations. If you are new to these meditations, it can be useful to read these instructions for the Vipassana, Dynamic or Kundalini meditations before you come. If by the advertised time no other experienced person is present, insert the relevant meditation CD in the CD player, and become fully immersed in the various stages of the meditation. Enjoy and feel at ease in this beautiful hall. Dru Yoga with Yuti. Please check with Yuti on 0412 262467. For more about Dru Yoga, see here. Kabir says, "I longed and I searched long for God, but I could not find him. Then one day I dropped that longing, that desire, that search, and since that moment he goes on following me. He is always with me. In fact, he has always been with me, but I was so occupied with searching that I never saw him." I call this the totally relaxed state of your being: when there is no search, no inquiry, no question, when you are so relaxed that you start falling deep within your own being. Soon you touch the rock bottom of it; from that touch great revelations happen. You are not inquiring about God, God starts inquiring about you. That's actually what Kabir says, "When I stopped searching for him, He started following me. Now he goes on calling me, 'Kabir, Kabir, where are you going?' And I don't care a bit at all about him - because I know the moment I start caring about him he will disappear. Either I can be or he can be; we cannot both exist together." All those who are seeking the depths of life and the secret -- the ultimate secret of consciousness -- are bound to move knowingly or unknowingly towards someone who has already reached the home. Meditation is only needed to undo what society has done. So, be intelligent, bring the quality of intelligence. And the more you become intelligent, the more capable you will become of bringing more intelligence in your life. Each single moment can become so luminous with intelligence. Then there is no need for any religion, NO NEED TO MEDITATE, no need to go to the church, no need to go to any temple. No needed for anything extra! Life in its intrinsicness is intelligent. You just live totally, harmoniously, in awareness, and everything follows beautifully. Meditation is a very simple process: all that you need to know is the right button. The Upanishads call it "witnessing" -- the right button. Just witness your mind process, don't do anything at all. Nothing needs to be done, just be a witness, an observer, a watcher, looking at the traffic of the mind -- thoughts passing by, desires, memories, dreams, fantasies. Simply stand aloof, cool -- watching it, seeing it, with no judgment, with no condemnation, neither saying, "This is good," nor saying, "This is bad." Don't bring your moral concepts in, otherwise you will never be able to meditate. That's why I am against the so-called morality: it is anti-meditation, because a so-called moral person is so full of his moral ideas -- shoulds and should-nots -- that he cannot watch, he cannot simply watch. He jumps to conclusions: "This is not right and this is right." And whatsoever he feels is right, he wants to cling to it; and whatsoever he thinks is wrong, he wants to throw it out. He jumps among the thoughts, starts fighting, grabbing. And that's where he loses all witnessing. 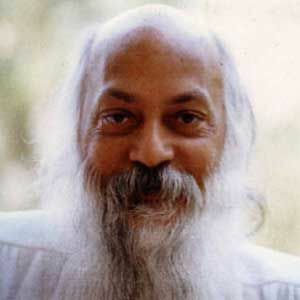 Witnessing simply means a detached observation, unprejudiced; that's the whole secret of meditation. It is simple! Once you have known the knack of it it is the most simple thing in the world, because each child is born in that innocence. You have known it in your mother's womb, you have known it when you were a small child -- so it is only a rediscovery. Meditation is not something new; you have come with it into the world. Mind is something new; meditation is your nature. It is your nature, it is your very being. How can it be difficult? You just have to know the knack: watch. Sit by the side of a river and watch the river flowing. Yes, sometimes driftwood passes by and sometimes a boat comes and sometimes a dead body and sometimes a beautiful woman may be swimming in the river -- you simply watch, you don't get bothered, you remain cool, you don't get excited. You are not supposed to do anything, you have nothing to do. It is the river and it is the river's business. You simply sit silently. Sitting silently, slowly slowly the art is learned... And one day, the moment your watchfulness is total, the mind evaporates. . .